Introduction of a fancy Persona Series Special Edition helps send this generation of the world’s best-selling hybrid out on a luxury note. An all-new design will launch for model-year 2016, billed as a leap forward in gas-electric technology. That relegates the 2015 as a sort of placeholder while attention is focused on the coming fourth-generation. The Persona edition is its swan song. 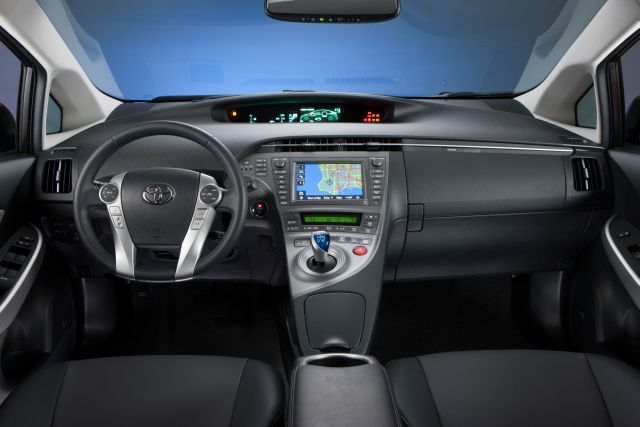 Why should I wait for the 2016 Prius? To audition bleeding-edge gas-electric-vehicle science – and to get the latest in aerodynamic styling, plus first-time availability of all-wheel drive. The redesign will showcase advances in battery, electric-motor, and gasoline-engine technologies. Potential fuel-economy gains alone may be worth the wait. The ‘16 will cost more, but it will look fresh well into the future and will be worth more at resale than the outgoing model. 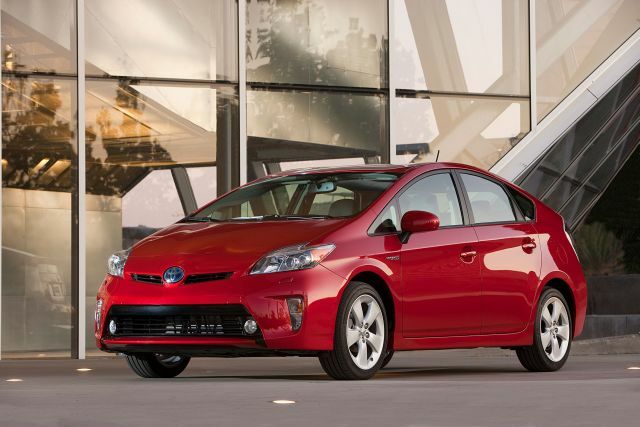 Should I buy a 2015 Prius instead? If you want a hybrid archetype with technology that’s still plenty space-age — including a Plug-In model that gets the equivalent of 95 mpg. Some value-priced equipment bundling may be the automaker’s way of encouraging you to buy the swan-song edition of the outgoing generation. Even without that, expect some bargains as dealers clear inventories to make way for the redesigned ‘16s. Note that there actually are three versions of this car: the “classic” hatchback, the larger “v” model, and the smaller “c.” It’s the classic that’ll be all-new for ‘16. The next v probably will continue on its current platform until model-year 2018. And customer demand is likely to determine if and when a successor to the c model shows up. Only if you count the Persona’s unique trim details, which include 17-inch alloy wheels with a dark metallic finish. That’ll be about it, given that resources have already been diverted to the redesign. The ’15 reprises three body styles: the “classic” four-door hatchback; its similar-looking but larger cousin, the v; and the subcompact-class four-door hatchback, the c. All seat five and have front-wheel drive. The classic and v share the same underskin architecture, with the classic furnishing 39.6 cubic feet of maximum cargo volume and the 6-inch-longer v a maximum 67 cubic feet. The Plug-In is based on the classic model. Pitched as a youthful, urban runabout, the c uses the structure of the automaker’s Yaris small car but grafts on a sleeker body and a Prius hybrid drive system. It has 17.1 cubic feet of cargo space and a much tighter interior than the classic and the v, which are as roomy inside as many midsize cars. Nothing uppity about the trim-grade names: they’re labeled “One” through “Five” in escalating levels of equipment and price. Not every version gets all five grades, though, and the Plug-In is limited to base and “Advanced” models. Both should again sport chrome exterior trim and unique-looking 15-inch wheels to differentiate them visually from standard models. The Persona is based on the classic body style in the Three trim grade. It’s available in two colors, Absolutely Red, a first-time hue for this car, and Blizzard Pearl, which costs $395 extra. Seats and steering wheel are covered in the automaker’s leather-surrogate SofTex material, here in black with gray stitching. It has dark chrome interior trim and blue front footwell illumination. Not until the redesign, when both the gas and electric systems are expected to be more powerful and more efficient. That means the ‘15s will continue with a proven version of the company’s Hybrid Synergy Drive system which teams a four-cylinder gas engine with two small electric motors It automatically taps either power source in combination or individually to balance fuel conservation and acceleration. The engine in the classic and v will again be a 1.8-liter and output a net 134 horsepower. The c will use a 1.5-liter engine and net 99 horsepower. These cars use a nickel-metal-hydride battery. The Plug-In, by contrast, comes with a cord that enables it to utilize an initial charge from a residential or commercial connection. Its battery pack, a lithium-ion type, can store enough plug-in charge to propel the car about 11 miles and up to 60 mph on electricity alone (versus about 1 mile and 46 mph for the standard powertrain). After that, just like the standard models, the Plug-In reverts to combined gas-electric hybrid drive and recharges via regenerative braking. To charge the Plug-In for full electric-only range takes about 3 hours using a 120-volt household source and 1.5 hours with a heavier-duty 240-volt outlet. All versions also save gas by automatically shutting off the engine while they’re stopped. No; they’ll repeat the 2014 ratings, which were 51/48/50 mpg city/highway/combined for the classic model and 53/46/50 for the c. That should be enough to maintain them as the highest-rated cars sold in the U.S. that are not plug-in hybrids or pure-electric vehicles. The Prius v is about 230 pounds heavier than the classic model (some 775 more than the c); it’ll again rate 44/40/42 mpg, still not at all bad for so spacious a vehicle. Using the EPA miles per gallon-equivalent (mpge) for electric propulsion, the Plug-In will again rate 95 mpge. Running in “standard” gas-electric-hybrid mode, the Plug-in should again rate 50 mpg city/highway/combined. In practice, all these cars are most efficient in low-speed, city driving, where they can run exclusively on electric power and best utilize the engine stop-start feature. Unlikely. If there’s any change, it would be shuffled combinations of existing features. The equipment list already brims with clever technology, including solar-charged climate control, self-parking, and lane-wander compensation. The Advance Technology Package, for example, has Pre-Collision to cinch seatbelts and pre-apply the brakes when a crash is imminent; Dynamic Cruise Control to maintain a set distance from traffic ahead; Intelligent Park Assist to automatically back the car into a parallel parking space; and Lane Keep Assist to steer it back into the intended highway lane. Highlighting the fairly comprehensive infotainment suite is the automaker’s Entune system. Interfacing with an onboard smartphone, it delivers a variety of Internet entertainment and information apps, including the Bing search engine and text-message-to-speech capability. Starting with the Three levels and included on both Plug-In models, Entune will combine with GPS navigation that responds to voice commands and a dashboard touchscreen. Bluetooth phone and audio connectivity and a USB iPod interface and should remain standard on every model. Expect them to increase only slightly, though don’t be surprised if Toyota even holds the line on some versions. Base prices in this report include the manufacturer’s destination fee, in this case, around $810 for factory-distributed cars.) Figure the standard hatchback’s retail models to begin around $25,200 for the Two and reach a base price of around $31,000 for the Five. The Persona Special Edition will list for $27,810. We estimate a base price for the Plug-In at around $31,000 for the base version and $35,900 for the Advanced. Plug-In buyers may qualify for a federal tax credit of approximately $2,500, as well as additional state tax credits. And the carmaker recommends Plug-In buyers install a home charging station. Its “approved provider” is the electrical-device maker Leviton, which will install a 120-240-volt unit starting around $1,000 – not including various permit fees or additional costs based on site conditions. 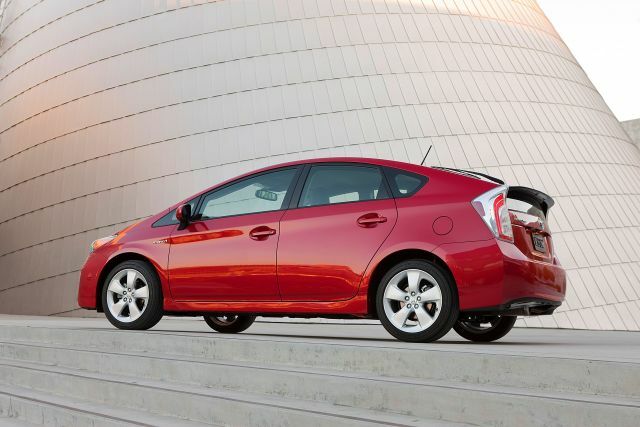 Estimated base-price range is $$27,800-$31,500 for the v wagon and $20,100-$24,500 for the c.
Look for the final editions of this third-generation Prius in showrooms by fall 2014.As for the redesigned versions, expect the standard hatchback to be released in late 2015 or early ’16. That’s a delay from the original early ’15 target. Engineers reportedly required more time to insure fuel economy gains and to develop the new modular structure, which will also underpin some of the carmaker’s other passenger vehicles. The new Plug-In version should arrive in late 2016, possibly as a 2017 model. The v model is available with a panoramic moonroof, but only the Four and Five trim levels of classic hatchback can be equipped with the Solar Roof Package. This embeds solar panels in a power sliding glass moonroof. The cells power a circulation fan while the car is parked, thereby reducing gas-consuming cool-down loads on the air conditioner. When the Deluxe Solar Roof Package is ordered for the Four, or the Advanced Technology Package on the Five, you also get a head-up display that projects key instrument readings onto the windshield ahead of the driver.